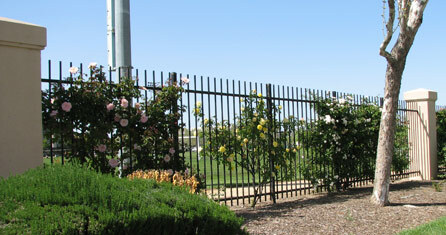 We have a collection of about 250 climbing roses on the fence at Santa Clara University. The fence is in both directions from the campus entrance sign at the intersection of The Alameda and El Camino. There are no plaques by these roses to let you know what they are, so the list below will help you find them. 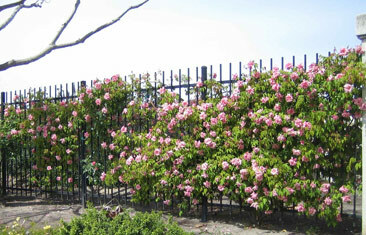 Each section of fence has four rose locations. The section number is found under the top crosspiece of the fence, on the right end as you face the fence from the street. As a guide to reading the table below, SC-23-3 means "Santa Clara- fence section 23- 3rd rose in the section". Here are a few picture of the roses on the fence. The second and third pictures are to help you find the location numbers. Follette in full bloom on the fence on The Alameda. A section of the fence along El Camino Real. Roses are numbered right to left when seen from the sidewalk. 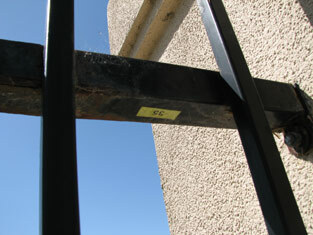 A section number, located under the right end of the upper cross bar of the fence. SC-02-4 Clair Matin LCl 1960 Meilland, M. L.
SC-05-1 available . . .
SC-05-3 available . . .
SC-06-1 empty . . .
SC-07-4 empty . . .
SC-08-1 Flutterbye S 1996 Carruth, T.
SC-10-2 Orfeo, Cl. LCl 1963 Leenders, J.
SC-10-3 Windermere HWich 1932 Chaplin Bros.
SC-10-4 General MacArthur, Cl. Cl HT 1923 Dickson, H.
SC-14-3 Mrs. Aaron Ward, Cl. Cl HT 1922 Dickson, A.
SC-15-3 Annie Vibert N 1871< Vibert? SC-16-1 [Unknown Red Eglantine] E . .
SC-17-1 available . . .
SC-17-4 [Salmon-orange HWich] LCl . .
SC-18-1 Cadenza LCl 1967 Armstrong, D. L.
SC-18-2 Chevy Chase HMult 1939 Hansen, N. J.
SC-22-3 Christopher Stone, Cl. Cl HT 1942 Marsh's Nurs. SC-23-2 available . . .
SC-24-1 White Dawn LCl 1949 Longley, L. E.
SC-24-3 available . . .
SC-24-4 Cadenza LCl 1967 Armstrong, D. L.
SC-25-2 Clair Matin LCl 1960 Meilland, M. L.
SC-30-3 Kathleen Harrop B 1919 Dickson, A.
SC-33-4 Fortune's Double Yellow Cl T 1845int . SC-34-4 Looping LCl 1977 Meilland, M. L.
SC-35-1 available . . .
SC-35-3 available . . .
SC-35-4 Twilight Mist HGig 1995 Robinson, P.
SC-36-1 Carnea [smooth-leafed variety] HMult . .
SC-37-1 empty . . .
SC-38-3 [White/pink HT] HT . .
SC-41-4 empty . . .
SC-45-2 President Herbert Hoover, Cl. Cl Per 1937 Cant, B. R.
SC-45-3 available . . .
SC-46-1 Fugue LCl 1958 Meilland, M. L.
SC-47-2 Compassion LCl 1973 Harkness, J.
SC-48-2 Kaiserin Auguste Viktoria, Cl. ClHT 1897 Dickson, A.
SC-50-2 available . . .
SC-50-3 Rose Marie, Cl ClHT 1927 Pacific Rose Co.
SC-51-3 empty . . .
SC-52-1 available . . .
SC-52-2 Gem of the Prairies HSet 1865 Burgess, A.
SC-53-2 empty . . .
SC-54-1 R. soulieana Sp 1896in . SC-55-3 Weisse New Dawn HWich 1959 Berger, W.
SC-57-3 Baby Shower Cl Min [no reg.] Moore? SC-60-4 R. banksia var. H Bank . .
SC-64-2 "Unknown climber" . . .
SC-64-4 Coralie HWich 1919 Paul, W.
SC-65-1 Bouquet d'Or N 1872 Ducher, Vve. SC-67-3 SCU cemetery?-unknown ClHT . .
SC-67-4 "SCU Cemetery 6" LCl . .
SC-68-1 available . . .
SC-68-4 "SCU Cemetery 10" . . .
SC-69-3 available . . .
SC-69-4 available . . .
SC-70-1 "SCU Cemetery 15" . . .
SC-70-2 "SCU Cemetery 16" . . .
SC-71-1 empty . . .